The funding, provided by early-stage investment group Equity Gap and individuals, will allow Safetray’s founder, Alison Grieve, to strengthen its patent protection and expand its markets in the Middle East and the United States.Grieve also used the cash to shift mass production of its lead product from China to the McLaren Plastics factory in Loanhead and take on four permanent staff. Posted on April 15, 2012 by Helen Milburn and tagged alison-grieve interview safetray. Click the image to read the full story, or follow the link below. After just one shipment, Edinburgh-based company Safetray Products decided to stop manufacturing its trays in China. CEO Alison Grieve talks to Isabel Lesto about how this small business made a big change. Why did you switch manufacturing from China to Scotland? At Christmas 2010 we received our first shipment from China. The 4,000 trays that arrived in the UK were unusable: it was heartbreaking. We managed to get the stock remade to specification, but we had to fly to China to sort this out. Quality control in China is really difficult; it is so expensive because there is such a big demand for this type of service. Besides this, lead times are longer and paying duty upfront is more difficult for cashflow. We are now manufacturing with the family-run business McLaren Plastics here in Scotland for the same price. We can control shipments more easily from the UK, and customs procedures are much more straightforward. How easy have you found this shift? Transferring manufacturing to the UK has not been easy. We had to modify the [tray-making] tool for use here; unfortunately when it was on the water from China, the tool manufacturer we had chosen in Stirling went out of business and we had to find another one. The one we found is excellent but further away in Yorkshire so we have had to go backwards and forwards quite a bit. What changes have you had to make to the supply chain? With production shifting back to the UK we've tightened up our supply chain. We've brought in a new member of staff to manager this, and we've just selected TPC Freight Management as our new forwarder. We had four bidders. We chose them because they've been so helpful; if they can communicate well at this stage, then I know that in the future I'm not going to have some shipment sitting at a port for four days without being told about it. The company is big enough to matter but small enough to care. They make us feel special. What logistics tips have you learned along the way? Regardless of who manages the supply chain we are ensuring that we know who the contact person is for each step along the chain. In a small business, what logistics hurdles have you faced? There are certain things I haven't understood because I've been told completely different things by different people - and when it comes to shipping, the devil's in the detail. It annoys me that there is an inability to get exact information, because exact information is necessary in export. Plan A is to manufacture in Scotland and export to the US, Europe and the UAE. We have had interest in South America and Canada. We're paying double duty right now in Canada so it's more a marketing exercise than profit-making. With South America we will probably get a distributor in Miami who will then take charge of distribution. Australasia is a market we have not pushed for but from which we have had a lot of interest, and with the strong [dollar] exchange rate this is an interesting market. Posted on March 15, 2012 by Helen Milburn and tagged alison-grieve interview safetray. Safetray has been selected as one of the faces of a new campaign by Business Gateway and was featured in a full page ad in The Herald newspaper. Click on the image to read the full story, or click the link below. Now, just over three years later, Alison's Edinburgh-based company, Safetray Products Ltd, is supplying two of America's largest food services companies and the product is being manufactured in Scotland. Sodexo USA and Compass Group USA became early fans of the Safetray, purchasing stock at a trade show in Chicago, and the company has now secured customers in the United Arab Emirates, as well as throughout the UK and Europe. Alison said: "It was very exiting when Patrick Robineau, Food & Beverage Director of the Four Seasons Hotel on the Las Vegas Strip, described the Safetray as an 'awesome product' after showcasing samples at a product innovation event, adding that he was 'very impressed' by the invention. "Securing orders with such leading names in the hospitality industry highlights how innovative the product is. The orders have sparked interest from across the globe, with enquiries coming in from hotel groups including Hilton and Marriot. It's amazing to think that a product made by a small Scottish company is now being used in places such as Alaska, San Fransisco and New York. 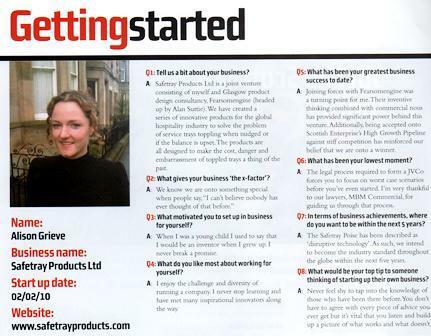 "I came up with the idea for the product in 2009 and Business Gateway Edinburgh supported me every step of the way - from ensuring my business plan was robust to helping me with the latest investment round. They helped me secure support from Scottish Development Interntational, which, along with a small overdraft from the bank, allowed me to attend the Chicago show. They also put me in touch with Scottish Enterprise, whose market research highlighted that America is the product's biggest market with 60% of its top 100 bars providing VIP table service areas." Alison added: "We are a classic Business Gateway story, in that we needed to develop intellectual property and it helped us secure a grant to do that. We needed to expand and export and so it put us in touch with SDI, and now, its support has helped us secure investment and we are also taking on new members of staff." Posted on February 21, 2012 by Helen Milburn and tagged alison-grieve interview safetray. For the full story, click on the article below or follow the link to read more. The recent history of Great Scottish Inventions has never quite lived up to the glory days of James Watt or Alexander Graham Bell. 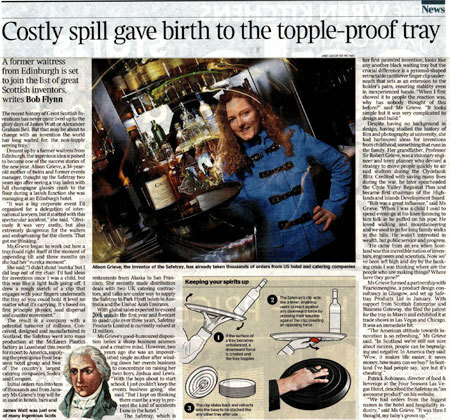 But that may be about to change with an invention the world has long waited for: the topple-proof serving tray. Dreamt up by a former waitress from Edinburgh, the ingenious idea is poised to become one of the success stories of the new year. Alison Grieve, a 34-year-old mother of twins and former events manager, thought up the Safetray after seeing a tray laden with full champagne glasses crash to the floor during a lavish function she was managing at an Edinburgh hotel. "It was a big corporate event I'd organised for a delegation of international lawyers, but it started with this spectacular accident," she said. "Obviously it was very costly, but also extremely dangerous for the waiters and embarrassing for the clients. That got me thinking. Ms Grieve began to work out how a tray could right itself at the moment of impending tilt and three months later she had her "eureka moment". She said: "I didn't shout 'eureka' but I did leap out of my chair. I'd had ideas for inventions since I was a child, but this was like a lightbulb going off. I drew a rough sketch of a clip that engages with your fingers underneath the tray so you could hold it level no matter what it's carrying. It's based on first principle physics, load dispersal and counter movement." The result is a company with a potential turnover of millions. Conceived, designed and manufactured in Scotland, the Safetray went into mass production at the McLaren Plastics factory in Loanhead this month for export to America, supplying the prestigious Four Seasons hotel group and two of the country's largest catering companies, Sodexo and Compass. Initial orders run into tens of thousands and from January Ms Grieve's trays will be used in hotels, bars and restaurants from Alaska to San Fransisco. She recently made distribution deals with two UK catering contractors, and talks are underway to supply the Safetray to Park Hyatt hotels in Australia and the United Arab Emirates. With global sales expected to exeed 200k units in the first year and forecast to quadruple over three years, Safetray Products Ltd is currently valued at £1 million. Ms Grieve's good-humoured disposition belies a sharp business acumen and a creative mind. The Safetray, which is her first patented invention, looks like any other black waiting tray but the crucial difference is a pyramid-shaped retractable cantilever finger clip underneath that acts as an extension to the holder's palm, ensuring stability even in inexperienced hands. "When I first showed it to people, the reaction was, 'why has nobody thought of this before?'" said Ms Grieve. "It looks simple but it was very complicated to design and build." Despite having no background in design, having studied the history of film and photography at university, she had harboured ideas for inventions from childhood, something that runs in her family. Her grandfather, Professor Sir Robert Grieve, was a visionary engineer and town planner who devised a strategy to move people quickly to air raid shelters during the Clydebank Blitz. Credited with saving many lives during the war, he later spearheaded the Clyde Valley Regional Plan and became the first chairman of the Highlands and Islands Development Board. "Bob was a great influence," said Ms Grieve. "When I was a child I used to spend evenings at his knee listening to him talk as he puffed on his pipe. He loved walking and we used to go for long family walks in the hills. He wasn't interested in wealth, but public service and progress. "He came from an era when Scotland was an incredible nation of inventors, engineers and scientists. Now we've been left high and dry by the banking crisis I was thinking, 'where are the people who are making things? Where have they gone?'" Ms Grieve formed a partnership with Fearsomengine, a product design consultancy in Glasgow, and set up Safetray Products Ltd in January. With support from Scottish Enterprise and Business Gateway, she filed the patent for the tray in March and exhibited it at trade shows in Las Vegas and Chicago. It was an immediate hit. "The American attitude towards innovation is so refreshing," Ms Grieve said. "In Scotland we're still not sure about success, people can be begrudging and negative. In America they said: 'Wow, it makes life easier, it saves money, how many can we buy?' In Scotland I've heard people say 'aye, but it's cheating'." Patrick Robineau, director of food & beverage at the Four Seasons, described the Safetray as "an awesome product" on his website. "We had orders in from the biggest names in the hotel and hospitality industry," said Ms Grieve. "It was then I thought, my baby's grown up." 1. If the surface of a tray becomes unbalanced, a downward force is created and the tray topples. 2. The Safetray's clip acts like a lever, enabling users to react against any downward force by pressing their knuckles against the clip, creating an opposing force. 3. The clip slides back and retracts into the base to be stacked like any other tray after use. 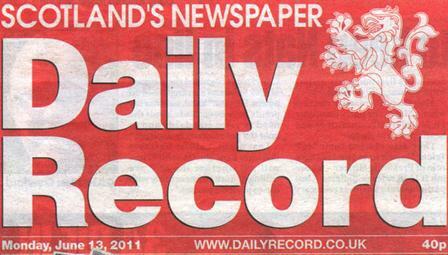 Posted on December 24, 2011 by Helen Milburn and tagged alison-grieve safetray interview. For the full story, click on the article, or see the text below. It is an event that usually unites an entire pub in comical cheering whenever it occurs. But the sound of a stack of glasses being dropped from a tray by a bar worker could soon be a thing of the past thanks to an Edinburgh inventor. Alison Grieve, 34, from Bruntsfield, has developed a "non-topple" drinks tray - the result of once watching an expensive bottle of Champagne tumbe to its destruction at an event she organised several years ago. The firm she has set up to sell it has now struck a deal to supply major US hotel chains, with thousands already sold. Ms Grieve said: "I know first-hand how embarrassing and costly it can be, not just on the pocket but on a company's reputation, when trays of expensive drinks fall over. It was one of those leap-out-of-the-chair moments." She secured help from Business Gateway Edinburgh - an organisation that aims to help people with aspirations to create their own firm - and carried out research on where to pitch her product. She said: "I came up with the idea in 2009, and Business Gateway has supported me every step of the way, from ensuring my business plan was robust to helping me with the latest investment round. "My adviser put me in touch with Scottish Enterprise, whose market research highlighted that America was going to be the producer's biggest market, with 60 per cent of their top 100 bars providing VIP table service, which focused my attention on cracking that first." The invention works thanks to a fitting on the underside - similar to a lever - which allows the knuckles of the hand to automatically counter movement within the tray. Each sells for around £16. The businesses which have bought into Safetray include the Four Seasons Hotels chain, Sodexo and Compass Group, meaning hundreds of bars will use the product. Now Ms Grieve wants to explore other areas of the world that have a similar approach to serving drinks, such as hotels in the United Arab Emirates. She has contacts in the area and across continental Europe and has made a success of her invention despite not having a background in design. She added: "Now that we have made inroads in America, our next target is the UAE, where we already have distributer interest in the product. It's true what they say about invention being one per cent inspiration and 99 per cent perspiration." Posted on December 6, 2011 by Helen Milburn and tagged alison-grieve interview safetray. See below for full story. Alison Grieve is in line to become a multi-millionaire with her invention, the Safetray, which has taken the worldwide hospitality industry by storm. The device, which looks like a normal black drinks tray, has a hidden hand clip on its underside, allowing the user to securely transport drinks without dropping them. Putting food on the table, literally, motivated Alison to become an entrepreneur. She realised that working for herself was a practical solution to juggling childcare and work. The 33-year-old from Edinburgh said: "It can be difficult to find work to fit around childcare, so when the boys were 18 months old I set up a small events business. "It was something I could do in the evening and book a babysitter. It became quite successful and I got into the corporate arena, doing some high-end events. "My parents had a cassette tape from when I was seven," she admitted. "My dad was asking what I wanted to be when I grew up and I said an inventor." She had her Eureka moment after witnessing a tray full of champagne glasses smashing on to a table at an important function. Alison said: "I watched in horror as the waitress lost control of the tray, spilling the contents all over the table and smashing glass across the venue just minutes before the boss of the host firm was due to arrive. "It struck me that an item that is used extensively throughout the hospitality industry, carrying not only glass and china but also piping hot liquids, was utterly precarious. "I had a few moments of silent brainstorming over such things as how a flip-flop attaches itself to a foot and the Safetray was born." She approached design consultancy Fearsomengine, who were able to translate her idea into drawings, develop materials and locate a factory to produce samples. They knew it was a winner as soon as they saw it and immediately agreed to be part of the company. Alison added: "I expected to get an income sooner than I did but every entrepreneur has since told me that it always takes longer than you'd expect. Running low on cash as an entrepreneur is tricky. "Sometimes I've had to rush to a meeting and get a taxi, or buy a suit that didn't have a hole in it. "We might have been living on a tightrope for the past couple of years but that's all about to change now that the orders are rolling in." The Safetray is now in production and thousands of orders have been requested throughout Europe and across America. "No matter how much money I make in the future, I know that the greatest wealth comes from having my family," she added. Posted on June 13, 2011 by Helen Milburn and tagged alison-grieve interview safetray. To read the full story, click on the article. Also benefiting from assistance from Smart Exporter is Alison Grieve, of Safetray Products Ltd, who design, manufacture and distribute a tray that never topples over, for the safe serving of food and drink in the hospitality industry. Alison said: “I attended an excellent road show which was both inspiring and reassuring. I was very pleased to be present at the start of what is set to be a very worthwhile programme for ambitious businesses in Scotland. It’s run by a great team with a wealth of experience and expertise between them. “With orders coming through to us from countries such as Australia, Cyprus and the US, it is vital that we are equipped with the correct knowledge to enable us to trade internationally. “Being able to network with other exporting companies creates a tremendous buzz of excitement and the knowledge shared is invaluable. Posted on March 31, 2011 by Helen Milburn and tagged alison-grieve interview safetray. To read the full story, click the article. Q: Tell us a bit about your business? A: Safetray Products Ltd is a joint venture between myself and Glasgow product design consultancy Fearsomengine (headed up by Alan Suttie). We have created a series of innovative products for the global hospitality industry to solve the problem of service trays toppling over when nudged or if the balance is upset. The products are all designed to make the cost, danger and embarrassment of toppled trays a thing of the past. Q: What gives your business ‘the x-factor’? Q: What motivated you to set up in business for yourself? A: When I was a young child I used to say that I would be an inventor when I grew up. I never break a promise. Q: What do you like most about working for yourself? A: I enjoy the challenge and diversity of running a company. I never stop learning and have met many inspirational innovators along the way. Q: What has been your greatest success to date? Joining forces with Fearsomengine was a turning point for me. Their inventive thinking combined with commercial nous has provided significant power behind this venture. Additionally, being accepted on to Scottish Enterprise’s High Growth Pipeline against stiff competition has reinforced our belief that we are on to a winner. Q: What has been your lowest moment? A: The legal process required to form a JVCo forces you to focus on worst case scenarios before you’ve even started. I’m very thankful to our lawyers, MBM Commercial, for guiding us through that process. Q: In terms of business achievements, where do you want to be within the next 5 years? A: The Safetray Poise has been described as ‘disruptive technology’. As such, we intend to become the industry standard throughout the globe within the next five years. Q: What would be your top tip to someone thinking of starting up their own business? A: Never feel shy to tap into the knowledge of those who have been there before. You don’t have to agree with every piece of advice you ever get, but it’s vital that you listen and build up a picture of what works and what doesn’t. Posted on May 31, 2010 by Helen Milburn and tagged alison-grieve safetray interview. Posted on March 18, 2010 by Helen Milburn and tagged alison-grieve safetray interview. Posted on March 17, 2010 by Helen Milburn and tagged alison-grieve interview safetray. Safetray was featured in Business 7 newspaper. A mother with no previous design experience has come up with a novel invention Scottish Enterprise has already tipped for global success. 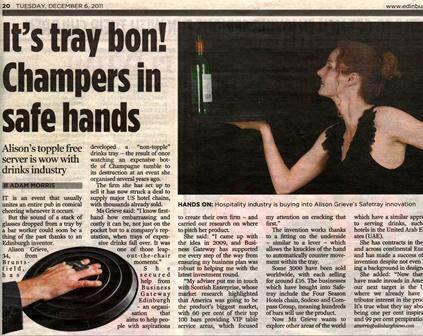 Event organiser Alison Grieve has devised a stackable tray with retractable hand support for the hospitality industry. The idea for the product - Safetray - came to her after seeing a waitress drop a tray of drinks at an event last year. This idea stuck in her mind, and she spent the next two weeks devising the concept in a series of drawings. These were then taken to design company Fearsomengine to devise a prototype. Directors Geoff Jones and Alan Suttie were so impressed with the concept they agreed to offer their services in a joint venture agreement with Grieve. Following five months of design tweaks, Grieve then took a rough mock-up to Scottish Enterprise last autumn in an effort to secure funding grants to take the concept to the point of manufacture. SE was so convinced by the design they fast-tracked it on to the high-growth pipeline, giving Grieve access to innovation grants, research tools and Scottish Development International. She said: "The design for the tray is based on a similar idea to how a flip-flop works on the foot, but gives the person holding the tray support regardless of how the weight on top of the tray is distributed. "Because the idea could be easily replicated, we've spent the best part of six months securing the intellectual property rights for the design, but we are finally at the point of making our first batch of test models. "The national tests of the trays will begin in April, and the first 2,500 will be manufactured by the summer, which will be distributed throughout a national hospitality chain as part of the testing process. "We will have Safetray in bars, hotels and restaurants across central Scotland by the summer, and we expect to manufacture roughly 150,000 in our first year, generating around £600,000 turnover." Grieve hass brought her design from concept to the point of tooling in preparation for manufacturing for less than £50,000. 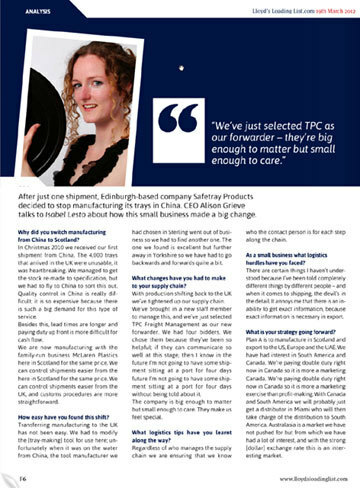 Although manufacturing will probably be done in China, Grieve hopes to lead the UK and European distribution from Scotland, and will look at partnerships to launch Safetray in Asia and the Americas with the help of Scottish Development International. Alison Grieve will be writing a regular blog for Business7 outlining Safetray's progress, and the ups and downs of being a young business. Posted on March 12, 2010 by Helen Milburn and tagged alison-grieve interview safetray.